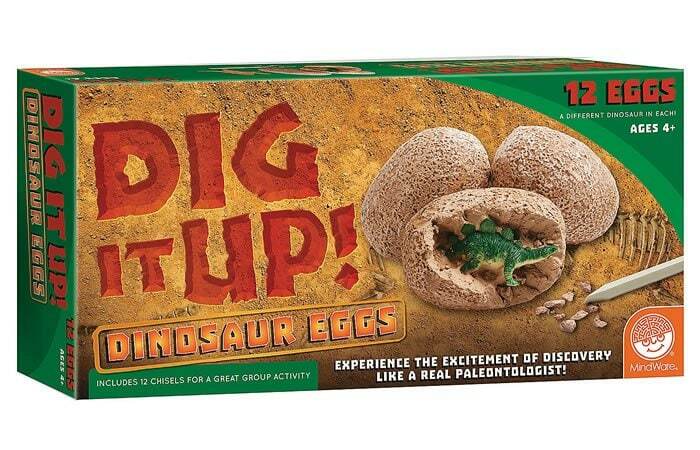 Have an aspiring paleontologist at home? Dig It Up! 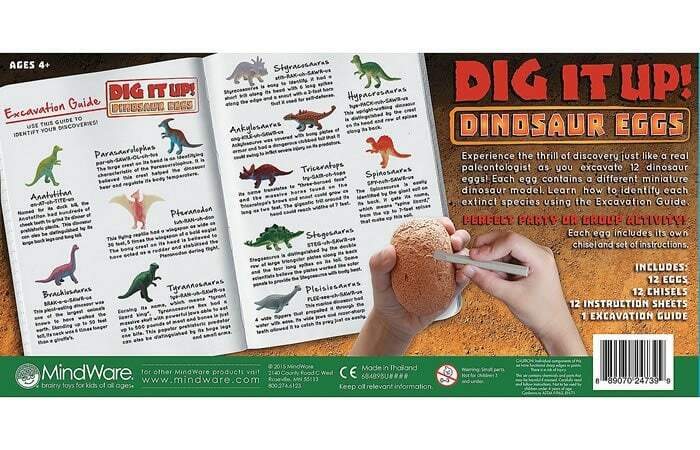 Dinosaur Eggs are great for a learning activity that keeps it fun for young children. Kids love to uncover the Dinosaur surprise and parents love the educational nature. It’s all about having fun while learning, without realizing you are. Digging up fossils for the little guys is always a hit at Field Station Dinosaurs Park in NJ. Now you can recreate that excavation experience at home or after school anytime you like. The Dig It Up! Dinosaur Eggs comes with 12 individually wrapped Dino eggs. Each egg comes with instructions and a chisel so your little one can feel like they are uncovering a mystery. The eggs are made of clay and each has a different dinosaur nestled inside of it. A downloadable lesson plan is available so you can talk about the particular prehistoric dino they set free. There isn’t a lot of technicality, nor should there be. Just soak the eggs for about 5 min or longer in water, the clay will soften up and they can use the provided plastic chisel to dig into the egg. The Dig It Up! Dinosaur Eggs are recommended for ages 4 and up. You’ll want to supervise but it’s a great way to interact and enjoy a fun learning activity with your child. The chisel is a bit small for adult hands but perfect for the little ones, just make sure you don’t let them run around jabbing things with it afterwards. Each individually wrapped egg comes with a chisel so you can safely toss them out when you’re done. The egg is made of clay so when they start chipping away you’ll have clay everywhere, but it isn’t a party until someone makes a mess! Lay down some newspaper so you can contain the debris. Our 5 year old children were so excited that they wanted to dig into all of them at once! We opted to have them open one each day as an after school activity and each day their first words after “I want a snack” were “can we open another egg today”? The Dig It Up! 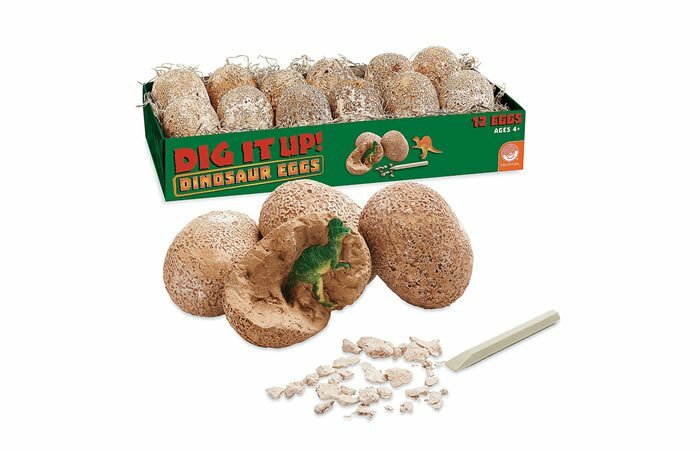 Dinosaur Eggs are a great as a stocking stuffer or birthday party activity and if the miniature dino’s aren’t enough, Dig It Up! has additional 4+ year old appropriate kits like the Sea Creatures, Wild Animals, and Big Bugs kits. For older children 8 years and older the Dig It Up! Fossils & Minerals pack, Discovery Kit, Big Dig Dino Model T-Rex or Triceratops that are a bit more involved. The Dig It Up! series are winners for parents and children, you’ll both enjoy the fun and your time together.